The landscape is obviously hand built but it fits nicely as a golf course. The clubhouse is in a shape of a falcon and everyone is friendly and welcoming. The course is in great conditions and fun to play! One of my favorite golf courses in this area. The course is just magnificent, with a great layout, greatly maintained and hard roughs. Lots of water on the course as well. The club house is just on spot with a great facility and great staff. I definitely recommend it. The hotel as well is great from rooms to service and food! Abu Dhabi is an amazing golf course. The club is used to hosting big events so all the facilities meet a high standard. The course has a great lay out. Big greens and thick rough. Everyone should play this course. Home to the Abu Dhabi HSBC - need I say any more. Covers 7400 yards of lush fairways and undulating greens, it's a true test of golf. Not for the beginner. The par-3 12th is aesthetically stunning, as too the iconic clubhouse at the back of 18. Genialer Golfplatz. Gute Challenge und einige anspruchsvolle Löcher. Macht enorm Spass zum spielen. Dieser Platz verspricht Spass und Herausforderung mit schweren letzten 3 Löchern. Bekannt ist der von Peter Harradine entworfene Platz vor allem wegen des Clubhaus in Falkenform. Doch auch der Platz ist eine Größe, denn die European Tour schlägt hier seit einigen Jahren ab. 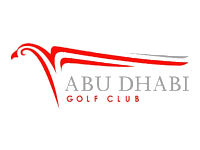 Seit 2006 findet hier zu Beginn jedes Jahres die Abu Dhabi HSBC Golf Championship statt. Martin Kaymer gewann hier bereits drei Mal die Falcon Trophy. Palmen, Waste Areas und gut platzierte Bunker kennzeichnen den eher flachen Platz. An jedem zweiten Loch kommt zudem Wasser ins Spiel. Die Grünkomplexe aus Bermuda-Tidwarf-Rasen sind wie bei vielen Championship-Kursen sehr großzügig angelegt und bieten viele Möglichkeiten für knifflige Fahnenpositionen. Die Qualität der Grüns und des gesamten Platzes bewegen sich auf hohem Niveau. Tolle Übungsmöglichkeiten!